Are too many of your leads unsubscribing? Do you know the quality of your database or is a majority of it inactive? Do multiple products and solutions make targeting a challenge? If you are asking yourself any of these questions, you need a segmentation strategy. 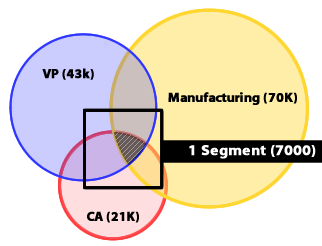 Segmentation is the process of dividing your database into targeted lists. Your go to market strategy, the data you collect, the digital behavior you track, how well you know your personas, will dictate how you target. The better you can define your audience, the more tailored your messaging can be. Demographics, products, content viewed, where in the buyer’s journey, and account based information are all examples of the kind of data useful in developing your strategy. The better you can target your leads, the higher your click-through rates and the lower your unsubscribe rates will be. Contact us to learn more about how our segmentation experts can help you build a segmentation strategy that will increase your campaign success.